It’s time for the annual Ellsworth United Methodist Church Sub Sale! Every November, dedicated volunteers go around to business in the greater downtown Ellsworth area and drop off order forms for some delicious Italian subs. These sandwiches are hand-made from the freshest ingredients, and include all the standard Italian fixin’s – meat (ham & salami), cheese, lettuce, tomatoes, pickles, peppers, onions, oil, salt & pepper. Subs are then delivered later in the week. Why not poll your office mates and get a bunch of orders placed at the same time? That way no one has to bring lunch from home that day – we’ve got it covered! Orders will be accepted from Monday, Nov. 1st-Wednesday, Nov. 3rd. 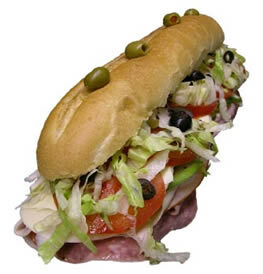 Subs will be delivered by noon on Thursday, Nov. 4th. Look for an Ellsworth United Methodist Church volunteer at your office on Monday, November 1st, or call 266-4891 to place your order.